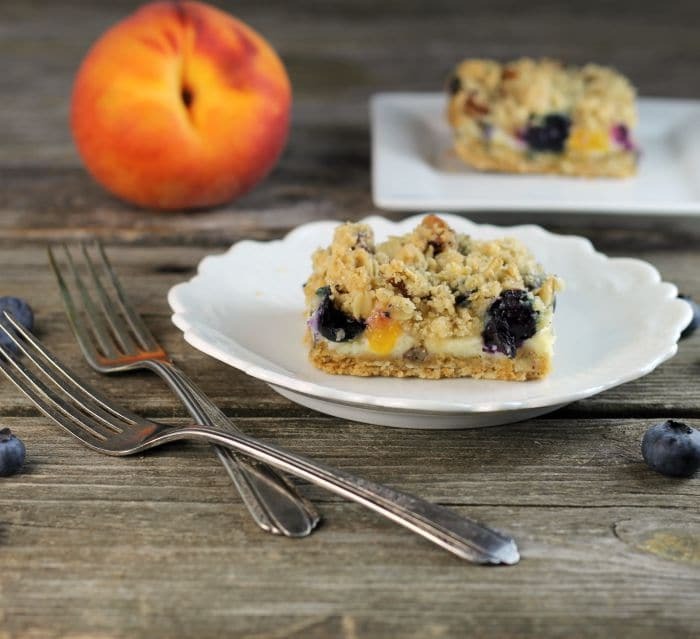 Blueberry peach crumble bars… delicious summer fruit baked between two layers of sweet buttery crumble. 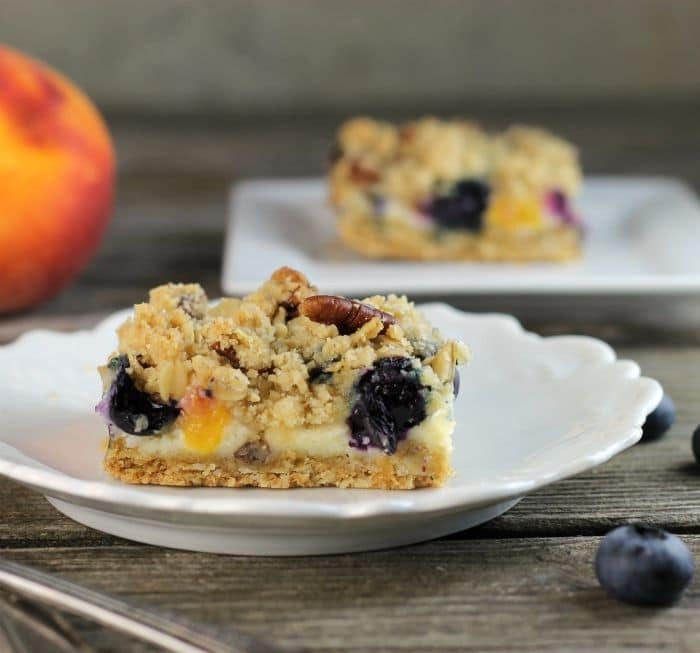 Blueberry peach crumble bars combine not only one of my favorite summer fruits but two summer fruits; they are super moist and so delicious. You know the crumble that is on top of most coffee cakes? That is my favorite part of the coffee cake. No kidding, I mean who can resist that sweet buttery crumble; it is over the top with yumminess. Is yumminess even a word? For this time we will go with it. If you love the crumble as much as I do you are going to love these bars, too! Yes, I can guarantee it. Then for the fruit, I couldn’t decide between two of my favorite summer fruits so I decided to use both of them. I really love all the summer fruits, but when it comes to blueberries and peaches it really is hard for me to pick which one would be my favorite. The blueberries and peaches blend together perfectly. I really love the combination! 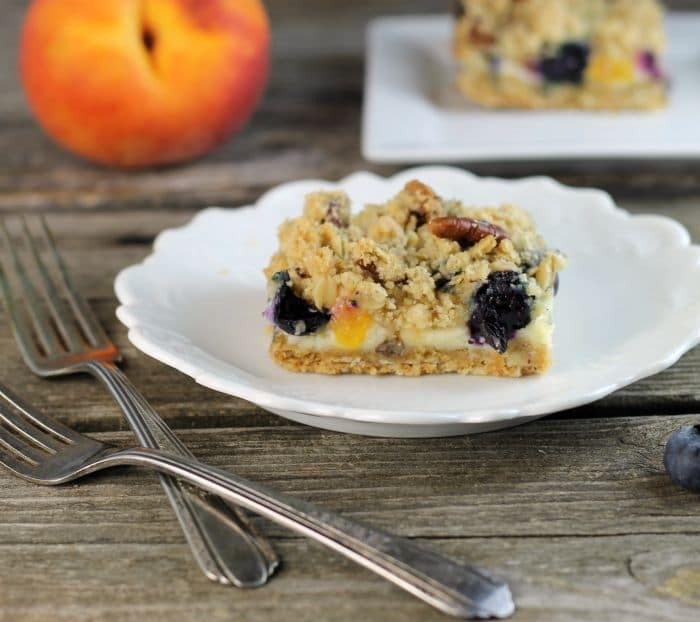 And before you know that summer fruits will only be a sweet dream, so make sure that you don’t wait to make these blueberry peach crumble bars. Oh man, I can’t believe that we are already in August. Before you know it the leaves will be changing colors. The summer is going by too quickly. But I am looking forward to the fall. Not sure if I mentioned, but I am going to be a grandma once again. Yep, number three is on the way. Our daughter-in-law and son are expecting their first baby in September. Then there is our daughter’s wedding in October. It is going to be an exciting fall! I took these blueberry peach crumble bars to my mom’s house over the weekend so that I could have my family do some taste testing. They all were raving about how yummy they were. That is always fun when you get great reviews. 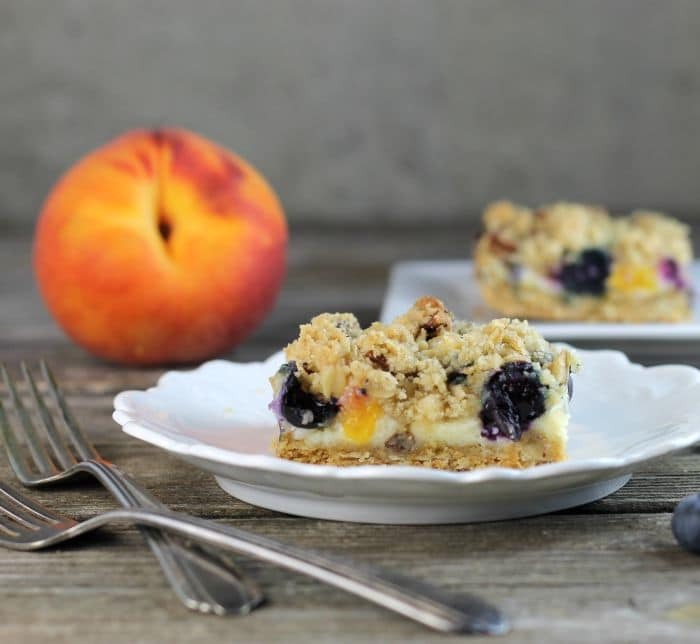 Blueberry peach crumble bars... delicious summer fruit baked between two layers of sweet buttery crumble. Mix the flour, oats, 1/2 cup sugar, 1/2 cup brown sugar, soda, and salt until well combined. Add the butter and cut in with a fork, pastry cutter, or by hand until the everything is combined and crumble is formed. Reserve 2 cups of the crumble for the top of the bars. The rest of the crumble pat into a greased 9 by 13-inch baking pan. Place into a preheated oven and bake for 10 minutes. While the bars are baking place the cream cheese in a medium bowl and beat with an electric mixer until it is creamy add the 1/3 cup of sugar and egg and mix in. Cut the peach into small pieces and mix with the blueberries. Add the 1/4 cup sugar and 2 tablespoons of flour, toss until well mixed. Add the pecans to the reserved crumble. Once the crust has baked for 10 minutes remove from the oven. Spread the cream cheese mixture over the top of the crust. Evenly spread the fruit over the cream cheese. Sprinkle the crumble over the fruit. Place bake in the oven and bake for another 30 minutes. Remove from the oven and set on the cooling rack to cool. Oh my gosh! These look great! I love blueberries and peaches together! And as soon as I see crumble in the title I am hooked! 😉 Congrats on the grandbaby! That’s so exciting! This looks totally irresistible! I like the combo of berry and stone fruit and that cream cheese filling is unbeatable! 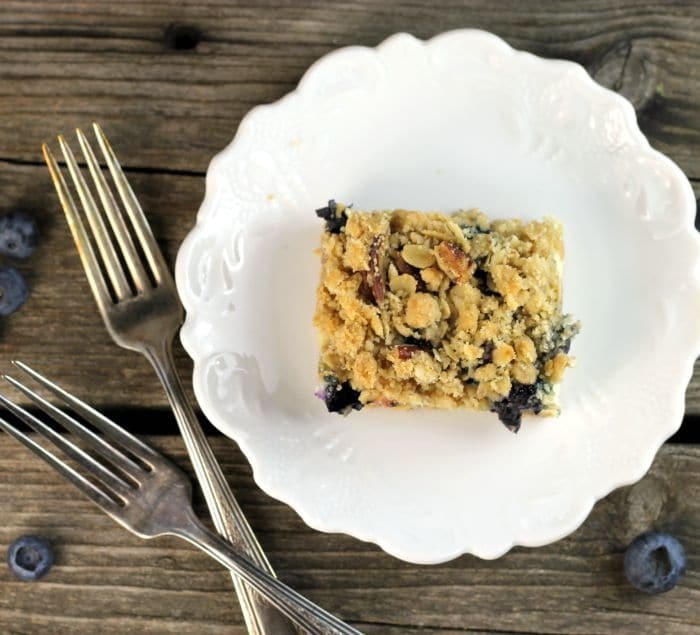 Love these blueberry crumble bars look absolutely delicious!! Wow, you’ve got a busy Fall coming your way, Dawn! Congrats in advance! 🙂 Now these bars? What a great combo of flavors! And I totally agree with you about the crumble. Mmmm…crumble. Pass me a bar?